Jo-Lonn Dunbar (58) spent four seasons with the Saints before signing with the Rams in 2012. ST. LOUIS — Just as predictable as the sight of reporters flocking to his locker following practice on Wednesday, Rams linebacker Jo-Lonn Dunbar knows that the trash talk between him and his friend Jimmy Graham is coming soon enough. Sunday’s matchup in St. Louis between the Saints and Rams pits Dunbar against his former team for the first time. And even though he’s almost two years removed from the last of his four seasons spent in New Orleans, it’s a game that still holds special meaning. The Rams (5-8) figure to have a tough challenge on their hands with the Saints (10-3), Graham in particular. The 6-foot-7, 265-pound former University of Miami basketball player is the top tight end in the NFL this season. He’s among the league leaders with 74 catches for 1,046 yards and leads the NFL with his 14 touchdown catches. The Rams’ defense will be tested in trying to defend Graham, who has 100 or more receiving yards in six of his 12 games this season. The St. Louis linebackers and safeties will have to play close attention to the monster in the middle and you can bet there will be a focus on No. 80 at all times. “We’re all going to have a chance to cover him, and we’re all going to have to answer that bell when it’s time,” Dunbar said. The 28-year-old Dunbar has had an up-and-down season in 2013. He had a breakthrough campaign a year ago when he started all 16 games and finished second on the team, behind James Laurinaitis, with 113 tackles. He also had 4.5 sacks, two interceptions and two forced fumbles. It’s been a different story this fall. He was suspended for the first four games after violating the NFL’s policy on performance-enhancing substances — Rams coach Jeff Fisher called him “selfish” and said it “hurt the team” — and was then released, only to re-sign with the Rams about a month later. Dunbar returned to action for the Jacksonville game but has struggled to make the same kind of impact he did in his debut season in St. Louis. According to the defensive stats that are based on the coaches’ video evaluation, Dunbar has 43 tackles and two quarterback pressures in his nine games. But the next assignment will be one of the Rams’ toughest. The Saints come in averaging 26.4 points, 302.9 passing yards and 394.3 total yards per game and are the third-best team in the NFL in third-down percentage (45.7), an area in which the Rams have struggled. The last thing the St. Louis defense wants to see is Graham’s signature touchdown celebration — the dunk over the crossbar. 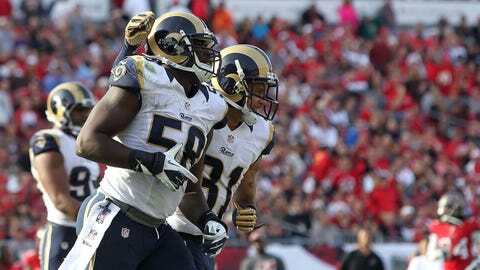 The Rams’ outside linebacker will have some other words for his friend soon enough, too. He knows the trash talk is coming soon.